Faculty member Tina Ashford, second from left, developed the "IT Museum" course. MGA students in the class include, left to right, Daniel Lee, Ryan Ashford, Matthew Ball, and Brandon Lewis. The five Middle Georgia State University students who signed up for Tina Ashford's new "IT Museum" class this fall just wanted to tinker with vintage computers that are, in most cases, considerably older than them. 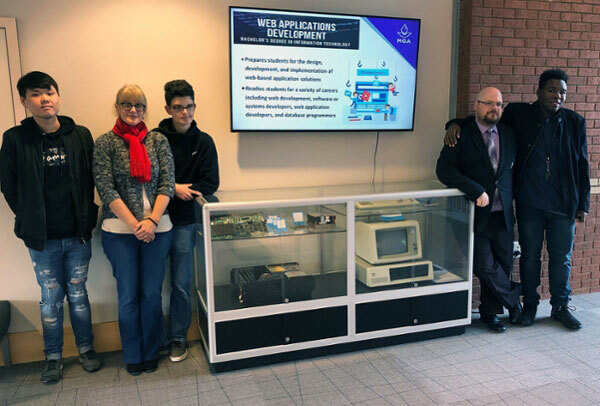 They ended up becoming de facto archivists and historians behind what is on the way to becoming a permanent display of classic personal computers and other equipment in a lobby and hallway of the Macon Campus's Professional Sciences building, where the University's School of Information Technology is based. "I saw it as a chance to mess around with these old devices," said Matthew Ball, 34, a senior. "It grew into something more." Today, using four glass display cases that were begged for, borrowed or donated, the Middle Georgia State (MGA) students are displaying vintage computers and parts they have restored to working order and catalogued all semester. An archival room in the School of IT contains several more old computers and additional parts that at least one of the students, who happens to be Ashford's son, will continue to restore this coming spring semester in order to get them into the museum display rotation. Faculty members donated some of the vintage computers, while others are University owned artifacts that were literally gathering dust in forgotten corners of the Macon Campus. On the back of an old Apple IIe in the archival room is a label with the words "Macon Junior College," one of the forerunners of Middle Georgia State. Another of the archival room treasures is a Macintosh SE that Ryan Ashford, a 16-year-old dual enrollment student, paid $70 for at an estate sale. After the device’s original owner died, his widow left the personal computer - an Apple product of the late 1980s - sitting undisturbed on her late husband's desk for the next 23 years. "It's weird because it sat there totally untouched for all those years," said the younger Ashford, for whom collecting and restoring vintage computers is a personal hobby, not just an academic pursuit. "It's perfectly preserved." When Tina Ashford, an associate professor of IT, developed the "IT Museum" course, she thought it would be a good way for some of Middle Georgia State's information technology majors to gain a historical prospective on computing and bring some order to the disorganized collection of vintage computers and parts that somehow find their way to the School of IT. "Learning about past technology shows us how technology is progressing," she said, "and helps us see what might happen in the future." In addition to Ashford's son and Ball, students who enrolled in the course are Daniel Lee, 22, a senior; Brandon Lewis, 23, a senior; and Danielle Williams, 26, also a senior. Lee took the course because he wanted to see old hardware up close; Lewis said he enjoys using and learning about old software. Ball was giddy to get his hands on one of the computers currently on display, an IBM PC-XT. The IBM PC 5150, introduced in 1981, was the first affordable personal computer sold by the tech giant. "I cut my teeth on that computer," said Ball, who is in the integrated digital media and game design track of the IT degree program. "One of the very first games I played growing up was on a machine like that. It's special to me. The development of computer games drove a lot of the discovery and innovation we see today." The museum's latest acquisition is an iMac G3, a computer that Apple launched in 1998 in a series of bright candy colors the company called "flavors." Dr. Neil Rigole, coordinator of the University's master's degree in IT, donated his "tangerine" model for the students to explore and catalog. The students began receiving some nice dividends as word of their computer restoration work spread this fall. For one thing, the University's Experiential Learning office provided each of the students with financial stipends and will award them EL credit. Also, the history and political science department invited the students to discuss the museum project at an upcoming undergraduate research conference. The attention the project is receiving led to their hopes that the museum becomes a permanent fixture with future generations of students restoring more vintage computers and parts and adding to the collection. Most of the students currently involved are close to graduating but Ryan Ashford is a sophomore, so he'll be around a while longer to keep the initiative going. Tina Ashford is floating the idea of a forming an official MGA student club of vintage computer geeks, which could include non-IT majors, to maintain the museum. "I really hope it keeps going," Ball said. "We've laid a lot of groundwork for future students to come along and apply their knowledge and talents to a worthwhile project."